Why I read it: I actually read it for the first time several years ago. I inherited a Christmas Village from my Grandparents a few years ago. It’s called the “Dickens Series Village”. It’s based on London during Charles Dickens time, and has buildings that come straight from his novels. 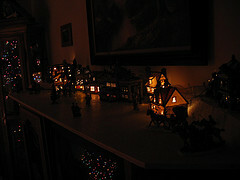 I have a whole set of buildings from “A Christmas Carol”, it made me want to read the book. I’d seen various movie adaptations, but I’d never read it. So I did and loved it! I was trying to decide which book I wanted to review for this week and my Dad started talking about A Christmas Carol. I had put the audio book version on his iPod for him (Jim Dale narrates, BRILLIANT!) and he told me how much he had been enjoying it. Then it clicked! A Christmas Carol is one of my favorites, and this is the perfect time of year to do a review for it! Also in the College Students Goodreads group this is one of our group reads for December. I think we all know the story of “A Christmas Carol”. We can call someone “Scrooge” and everyone knows what we mean. But for those of you who may not know the story (basically those that live in caves) here is a brief summary. Crotchety old Ebenezer Scrooge hates just about everything, especially Christmas. But he loves his money. So much that he doesn’t even spend enough money to buy enough coal keep his small business warm enough in the winter. His poor assistant is overworked and underpaid. His heart is just as cold, when he is asked for donations for the poor he replies “Are there no Prisons?... And the Union Workhouses? Are they still in operation?...Oh! I was afraid, from what you said at first, that something had stopped them in their useful course.” He then outright refuses to give over any of his vast amounts of money. It seems that nothing can change his hard heart. However something truly incredible is about to happen to Scrooge. That night he is visited by his old business partner, Jacob Marley. Who has been dead for 7 years. Marley somberly tells Scrooge that he has been bound with heavy chains because of the life he has lead and Scrooge is well on his way to the same fate.” I wear the chain I forged in life! I made it link by link and yard by yard! I gartered it on of my own free will and by my own free will, I wore it!” Marley tells him that Scrooge will be visited by three ghosts over the next three nights (a variation from the movies). The first two will come at one o’clock in the morning, the final ghost would appear at the stroke of midnight. To Scrooge’s horror Marley’s words come true. Scrooge is forced to relieve his past first, and then view the present day and then finally the future. This book has always been referred to as a classic and it deserves to be considered one. It tells a wonderful story redemption, forgiveness and of holding on to the things that truly matter most and never losing sight of that. So… read it! It’s not a long read but I think everyone should read it at least once, especially if you’ve enjoyed the movie versions. As usual a lot of things are changed when a book is made into a movie. If you like audio books you should check this one out! There are two versions, the abridged version is narrated by Patrick Stewart (Professor X, Captain Picard). The unabridged version is narrated by Jim Dale (narrated the Harry Potter books). Anyone have any particular favorite among the movies? My favorite will always be the 1951 version with Alastair Sim. I wanted to add a huge thank you to my Secret Santa from the Broke and Bookish! I've already finished "Before I Fall"! Thank you!!! I love the Dickens themed village! Perfect way to end this post. Love the Dickens village -- so cute! The Alastair Sim adaptation is my favorite too; I watch it every year, it just makes me happy. This book sounds amazing, great review! I've always wanted to read something by Charles Dickens but I've never gotten around to it. Now that I've read this I think 'A Christmas Carol' would be a great place to start! I think my favorite movie version will always be the Muppets'! Michael Caine is fantastic, and how can you not love a movie that includes the line: "Light the lamp, not the rat! Light the LAMP, not the rat!!!" Lana! That's my favorite too!! Still have to watch it for this year. When I read A Christmas Carol, I thought that it was one of the best adapted book to movie of all time considering if you took maybe any three version of the movie you would cover 99% of the book. When I read it, I thought that it was like reading a screenplay for all of the movies... haha which I guess it was! Still a great read though!